So it is raining again, and you are watching as the water is going down the drain and waterways. As a gardener, you can’t help but think how all this water could have been used for the good of your veggies. You don’t have to be a gardener to appreciate the benefit of having a rain barrel at your home. Having a rain barrel makes you self-sufficient and saves you tons of cash that would have gone into your water bills. This article will delve into the subject to help you choose the best rain barrel for your needs. The following are some of the factors that you should put into consideration before you go out and acquire a rain barrel. The location: you need first to consider the spot where your barrel will be sitting and then determine the size and other factors. The barrel should not be blocking a pathway or a sidewalk. There are various sizes of barrels in the market, and you should choose the one most appropriate according to the available space. The location of the spigot: typically, the faucet should be at the bottom of the barrel to allow efficient flow water through pressure. 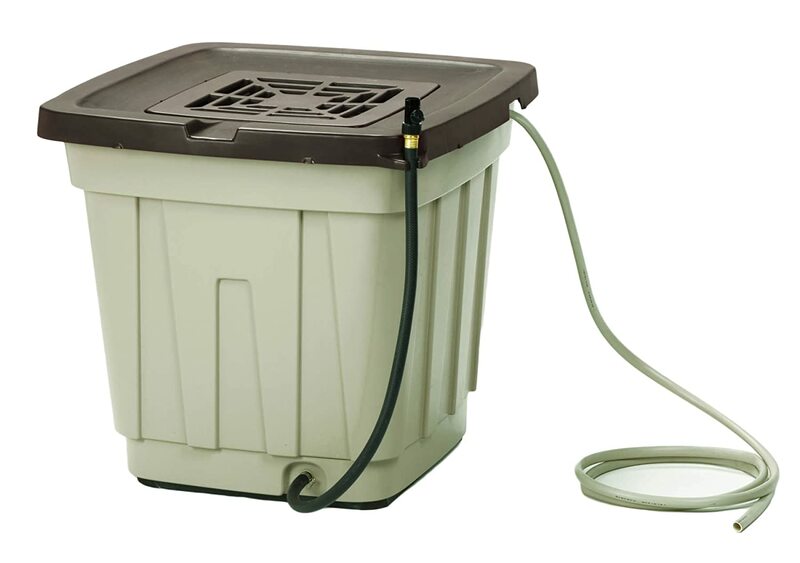 To accommodate a bucket, the rain barrel should be raised on a steady riser. If not careful, an unstable surface could tip off the barrel leading to accident and loss. Ideally, a low placed spigot would help in filling the container with water. However, it should be raised about half an inch from the bottom to prevent getting debris and other sediments collecting at the bottom of the rain barrel. To flush out this gunk, make sure the barrel has another outlet at the bottom below the spigot level. Is the spigot attached: you can get a rain barrel with an already attached spigot – most ideal. However, some barrels may require you to connect it yourself. Check for any leaks and utilize the waterproof caulk to control it. A large opening at the top: a large opening at the top is ideal as you will be able to use it to clean the barrel. If you are a gardener, you will want to attach a hose to the spigot and direct the water to the garden. However, the pressure usually is negligible. A large opening will also allow you to add water pump onto it to ensure a good flow of water. Safety: there is usually no need to trap water if you cannot take safety precautions. Uncovered and untreated water can harbor mosquitoes and other germs. The best rain barrel has a top screen to keep the mosquitoes from breeding and other debris from entering into your water. If there are children involved, the barrel should be on a stable surface. This will prevent a tip over when your curious children want to peer inside. The material: rain barrels can come in various designs and materials. The most common is plastic or polyethylene. Plastic is cheap and lightweight. It can also be found in different shapes and colors. However, you will need to place the barrel in places where it is protected from UV light. You will also need to find out if the plastic is BPA-free or not. Where this information is not publicly available, you may need to contact the manufacturer.Ceramics are excellent when it comes to collecting small amounts of water. They hold relatively safe water in comparison to other materials and so may be the most appropriate for your veggies. However, they can prove a challenge to install.Another great option safe from BPA is wood. Wooden barrels give your home an exotic feel – there is a sense of sophistication associated with oak barrels. However, wood is a more expensive option than plastic and are heavier.Metallic barrels are more rugged and can hold large amounts of water. They are permanent options but are also prone to rust and corrosion. Their maintenance may be more expensive than other materials. Overflow: an ordinary rainstorm can have more water than your barrel can hold. You need to think about the overflow as it can be a source of damage to your house‘s foundation. Cheap barrels in the market just let the water overflow over the top. However, there are better ones that come with diverters that lead excess water safely away. 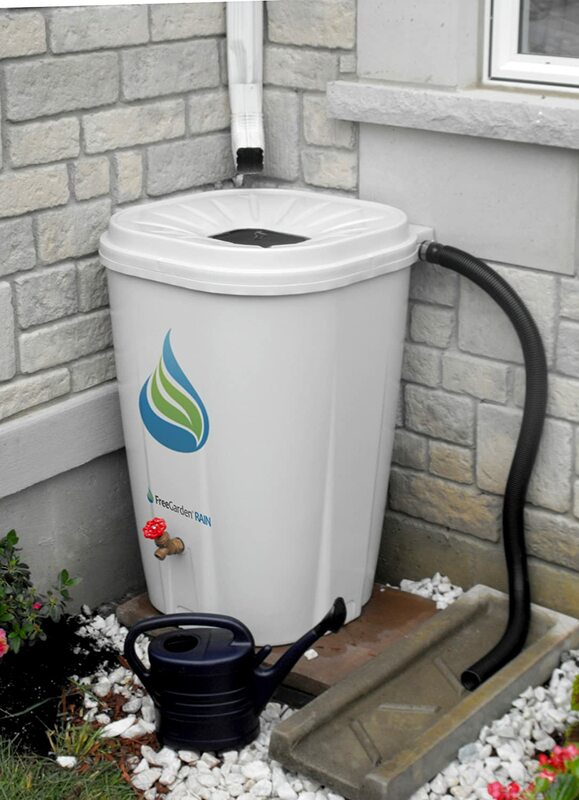 This rain barrel is innovatively designed to prevent the growth bacteria, and harmful algae – these microorganisms thrive in cool and moist environments, and the barrel would make a cozy palace. The barrel achieves this by restricting the flow of light into it. It is also made from a heavy-duty polyethylene resin, and you buy it ready to use. 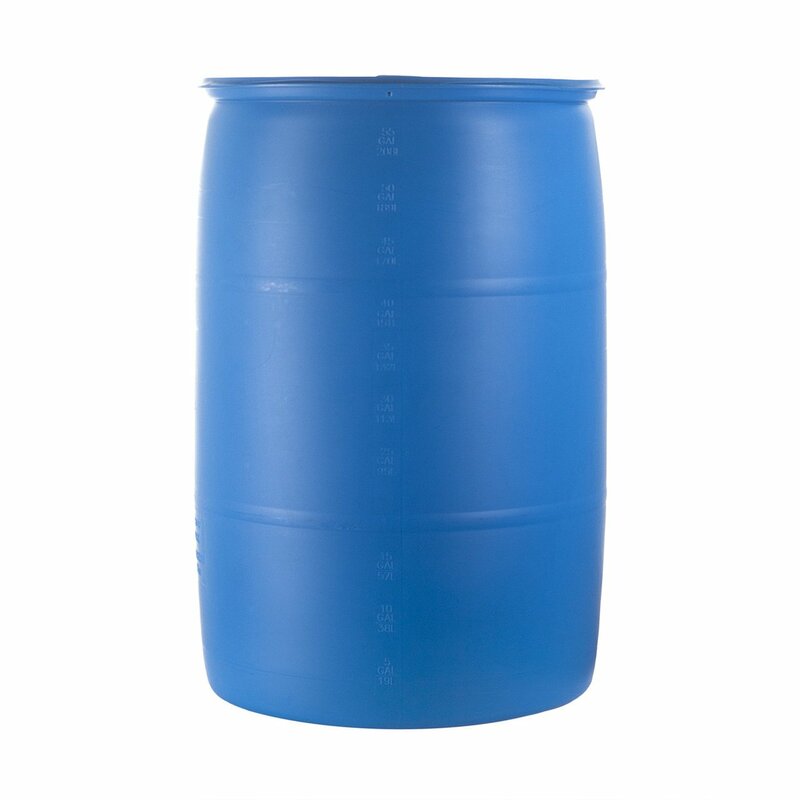 If you are worried about safety, this barrel is FDA-approved and free of any BPA. It is also safe around kids as the two bungholes on top have screw caps. This product is among the best and gathers water from the rain that you can then reuse in your garden. Regarding durability, this product is quite a rugged barrel that will be around for some time. The rain barrel also comes with a leader hose that you will not have to struggle to find one. It also comes with a tight cover to keep away pets and children. There is also a screen designed to catch debris and insects from getting inside. And should you see the need, this product is pretty easy to clean. The majority of water barrels in the market eventually get mold because of the constant water contact. This water barrel is different as it is injection molded to keep it in good condition year in year out. 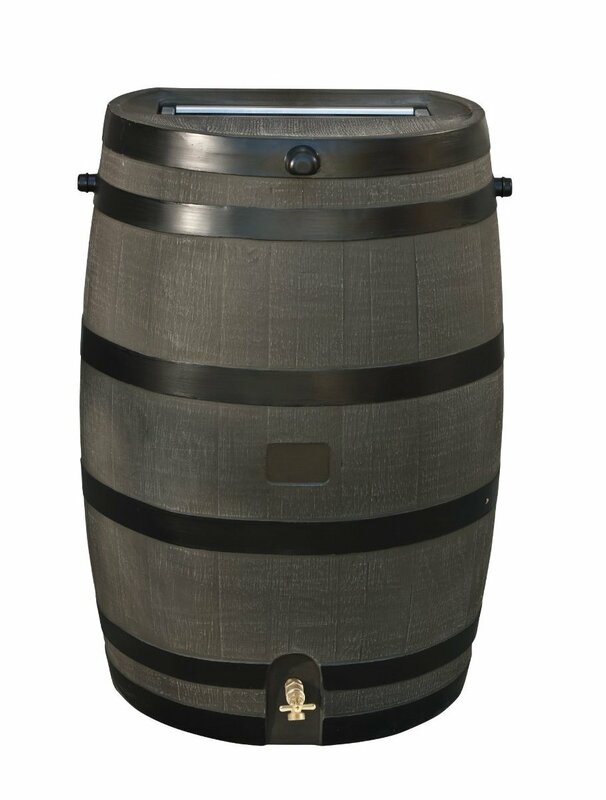 For easier access to the water, this barrel comes with a possibly easy to use brass spigot. Open water barrels are usually accidents waiting to happen when they fall inside especially when you are not around. This product comes with child locking screws to keep the curiosity of those meddling kids in check. And of course, this would not be among the best if it did not include an overflow hose to keep water away from the foundation of your house and a screen to keep the mosquitoes out. The barrel is made from recycled polyethylene, demonstrating durability. This barrel design inhibits UV light preventing the growth of harmful algae making the water safe – this does away with the need to put chlorine in the water. The brown color it comes in is quite appealing and would make a great addition to your yard – almost looks like a clay pot. It can hold up to 50 gallons of water. The barrel also has an overflow design that directs the water away from the foundation. This oak barrel is resistant to insect infestation and does not fade. It has a flat back that can comfortably sit on the wall reducing its footprint. To prevent debris and insects from the water, the barrel comes with an aluminum screen. Also, its openings are small enough to prevent pets and children from accidentally falling into them. The barrel also has a front side overflow that direct excess water away from the wall and foundation. In terms of appearance, this barrel is appealing enough to have at the side of your house. It will not look out of place. The best rain barrels in the market are designed to hold adequate water for your garden and other needs, is child and pet safe and inhibits the growth and spread harmful microorganisms. The water they contain should be safe for home use and gardening. In specific instances, they can also hold drinking water. Therefore, the containers should be BPA-free. To that effect, Emergency Essentials Water Barrel holds safe water for usage and has small top holes for the safety of the children – you can never be too sure of where they are and what they are up to. 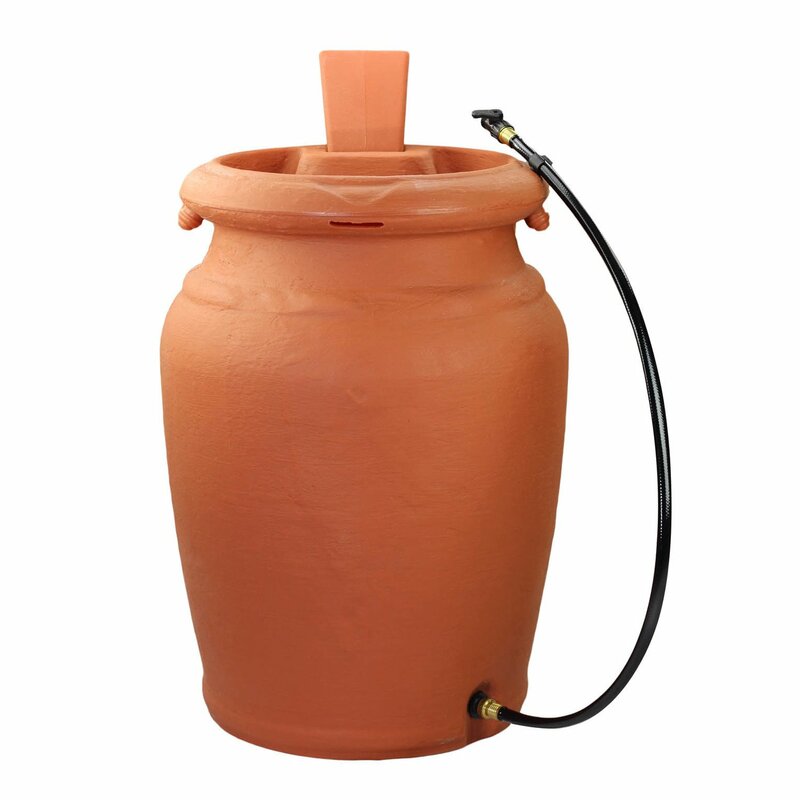 This water barrel has a flat backrest to reduce its footprint in your backyard and is easy to use. Remember to also check out the other options available and see the rain barrel reviews.